The Irish Wildlife Trust is not impressed with Heather Humphreys. THE IRISH WILDLIFE Trust (IWT) has criticised Heather Humphreys for her response to gorse fires. The Minister for Arts, Heritage and the Gaeltacht gave an interview on the subject on Radio Kerry earlier. Kerry is one of several counties that have experienced the fires of late. In fact, it has been one of the worst affected areas. There has been a 700% increase in the number of gorse fires in the county in the first quarter of 2015, compared to the same period last year. In an interview on Kerry Today with Jerry O’Sullivan, Humphreys said the increase in the number of fires was “very disturbing”. She said thousands of euro worth of damage was caused by the fires lit in March and April. They also threatened homes and damaged a section of the Killarney National Park. Humphreys said she expects prosecutions “if we can identify who the culprits are”. When O’Sullivan said farmers lit some of the fires because they are being financially penalised for not dealing with gorse on their lands, the minister said she didn’t want to prejudice garda investigations into the matter by speculating as to who was to blame. Given the 700% increase in the number of gorse fires in Kerry, O’Sullivan said current legislation isn’t working. However, Humphreys said she didn’t agree. Her department is currently looking into changing section 40 of the Wildlife Act, which makes it an offence to burn gorse between 1 March to 31 August. Over 180 submissions have been sent to the department on the issue, with farmers looking for the start date to be changed back to 15 April. Humphreys said she is trying to strike “the right balance in protecting the environment while allowing the farmers to farm the land”. She encouraged people to be mindful of the damage fires can cause and said anyone found guilty of lighting an illegal fire will face the prospect of a fine and/or jail time. During the interview, Humphreys maintained the fires which took place in the area were not an issue for her staff except where they occurred in Killarney National Park. The Irish Wildlife Trust (IWT) said the minister “appeared clueless and unaware of her responsibilities”. IWT Campaigns Officer Pádraic Fogarty said Humphreys ”seems blissfully unaware of her duties to protect areas of European importance for wildlife”. Extensive and devastating fires have raged through the country in the past few weeks, destroying all before their path, and Heather Humphreys seems clueless in her lack of response. 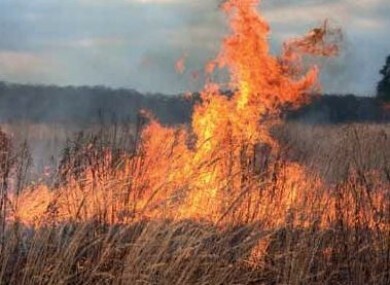 “The IWT believes that wild fires will only come under control when the Department of Agriculture stops single farm payments to those responsible. Upland habitats are being degraded at an alarming rate and it is disheartening to see those in authority shrugging their shoulders or looking the other way,” Fogarty stated. Humphrey’s department did not respond to a request for comment. Email “Minister accused of being 'clueless' over wildfires”. Feedback on “Minister accused of being 'clueless' over wildfires”.